Kevin Sinfield and James Lowes. Our fans’ panel look back on the appointment of Kevin Sinfield as Leeds Rhinos director of rugby and the derby defeat at Castleford Tigers. Ryan Hall is tackled by the Castleford defence. As weeks go it has been a bit of a whirlwind, with the news on Friday that our prodigal son, Kevin Sinfield, had returned. I, for one, never saw that coming at all, but a friend of mine did say after Brian McDermott was let go: “how about Sinny until the end of the season”? It’s going to be great having him looking after all the behind-the-scenes stuff, but the question still to be asked is, who is our next coach going to be? With Sir Kev’s name back at the club let’s hope we can pull in the kind of players our great club deserves. Michael Shenton halted by Josh Walters and Adam Cuthbertson. Picture Tony Johnson. Even he could not work his Magic at Castleford on Sunday, but after the first 40 minutes I did think he had, then we fell back into missing tackles and looking lost in attack just like we have done most of this season. Eight losses in a row is not a stat we wanted. This week’s training is going to be make or break and winning the next three games will decide our fate in the Super 8s/Middle 8s split. We are all behind you Sir Kev. Kevin Sinfield’s return has given the whole club a lift, however it is clear, the improvement process will take time given the performance at the weekend. Time though is not on our side. I said last week the timing of the change was baffling and although I am glad to see Kevin return, I stand by what I said about the timing. After the game he intimated that there were issues off the field that were a concern and also hinted of a player overhaul at the end of the season. Player retention and recruitment prior to Kevin did not sit at the feet of McDermott but of course I have never heard of a chief executive sacking himself. Whatever the issues, Sinfield and co need to find a solution to get three wins on the spin. Wakefield looked all but certain of a top-eight finish not so long ago but a win against them this Friday and the pressure mounts on them too. It will be a nail-biting, exciting finish to the season but at the wrong end of the table. It is an important time to get behind the team. It’s time to stand up and be counted! After the excitement of Kevin Sinfield’s return to Leeds Rhinos as director of rugby his first game in charge resulted in yet another defeat. This wasn’t totally unexpected as Castleford Tigers always raise their game against Leeds. This is the one opponent they want to beat each season more than any other. To be fair there wasn’t really enough time between the appointment of Kevin and James Lowes as the new coaching team and Sunday’s game for them to effect too many changes. They did however start with Jordan Lilly at half-back and Joel Moon back at centre. The Rhinos were still in the game at half-time but Castleford, especially Jake Trueman, were well on top in the second half. The home crowd will be expecting a much better performance against Wakefield Trinity tomorrow night. Nothing less than two points will do if Leeds are to have any chance of avoiding the bottom four. With Hull KR and Catalans Dragons improving with every game it is not going to be easy, but hopefully it is not beyond Sir Kev’s capabilities. Last Monday morning Brian McDermott got the sack. And we had till Sunday afternoon to get our season back on track. Confidence and morale were at a low. We’d lost seven games on the trot. Injuries apart, we should be winning more games with the skill of the players we’ve got. On Friday morning the press gathered round to hear Gary announce the new boss he’d found. The rumours were flying. Who’d be the new boss? Maybe Powell, Betts or Shaun Wane. Or someone from Oz? The new person to be in charge of the Rhinos was going to be SIR KEV! So, with the help of his assistants Rob Burrow and James Lowes. His first game in charge ….Cas at the Mend-A-Hose! We started off brightly. We all had high hopes. But after the break they had us on the ropes. Wakefield at home tomorrow. A game we desperately need to be winning. For pride, for confidence, for the players and us. A warm welcome home for Sinny! We have a new coaching structure with Sir Kev returning to Leeds Rhinos in a position I never thought I would see him in. With James Lowes as coach of the first team it will be interesting to see how this all goes. Sinfield being in charge of recruitment now could be a good thing; with him being so passionate about the club he can show other players what it’s about. The new coaches didn’t get off to the best start against Castleford on Sunday, but that was no surprise when only taking training for the first time on Friday. I am expecting the changes to be made for the Wakefield Trinity game tomorrow. We need to get the win or our Middle-8s place could be confirmed. 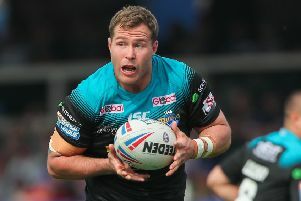 It’s sad to hear that Joel Moon’s agent has come out and said he won’t be at Leeds or Super League next season. It would be better coming from the club rather than him though. However his replacement at six is one to open people’s eyes. Tui Lolohea was very good in the last World Cup for Tonga. In the opening moments of the game Leeds looked positive and gave us fans some hope that we could compete with Castleford. We took the lead for a change and went on to go further ahead after Castleford had scored. Leeds continued to compete up to half-time, then whatever the coaching staff said to the players at half-time didn’t work. As the second half wore on Castleford upped their game and Leeds as a team began to fall apart. The new team of coaches have one heck of a rebuilding job on their hands, firstly to rescue what is left of a disastrous season in the league. Yes, there’s a Cup semi-final looming on the horizon, could Leeds possibly win the Challenge Cup and be relegated in the same season? It’s going to be a mammoth challenge for the new coaching staff to turn the club around.They aren’t even at base camp yet in their quest to get back up to the top of Everest. I cannot see us beating Wakefield tomorrow night either as we don’t create anything positive and the defence is a shambles.